Formula is a programming language and user-interface designed to aid in the repetitive evaluation of mathematical formula. 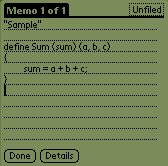 Programs are entered into the regular Palm Memo Pad application and then compiled into an internal format for use by the Formula evaluator. You can create collections of related functions and select among them; the input and output variables are presented in a list. Each time the 'Go' button is pressed, the function is evaluated and the results reflected on the screen. 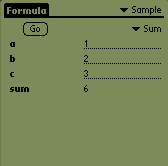 Formula uses the MathLib package written by Rick Huebner. Look at the readme, download the source for a loan computation formula or just download the complete formula package. Full source code is also available for Formula 0.30 and the Math Library.